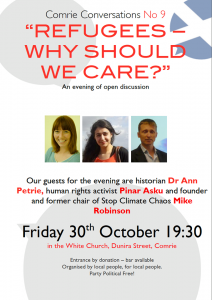 Comrie Conversations – Refugees, why should we care ? 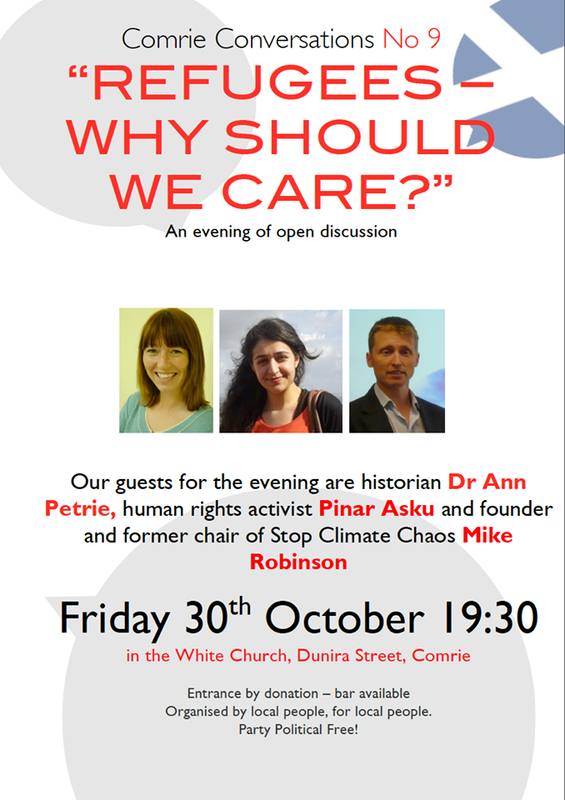 Dr Ann Petrie, a Comrie resident and historian, will give a historical perspective on immigration to and from Scotland, examining how new arrivals have been looked upon by society and portrayed in the media. Pinar Asku is a human rights and refugee activist. Pinar was detained twice in Dungavel and then in Yarlswood removal centre when her family first moved to Britain seeking asylum. Pinar has just returned from a Scottish Refugee Council fact finding trip to Greece to see first hand the situation facing local communities and refugees. Pinar will be talking about what she found. Finally, Mike Robinson, CE of the Royal Scottish Geographical Society will talk about the role of Environmental Justice in the movement of people now and in the future. Mike is the founder and former chair of Stop Climate Chaos Scotland. In addition, those concerned residents who set up ‘Comrie Solidarity for Refugees’ will be reporting on how best those who wish to can show their concern for the situation, take practical action to help and volunteer to take things forward. We hope you can come along, please spread the word and feel free to share.